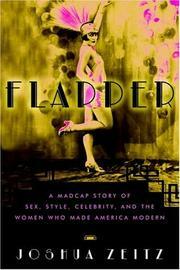 If the United States became modern in the decade after the First World War, a popular symbol of that modernity is the flapper, a scantily clad, frivolous young woman whose newfound freedom from restrictive clothing represented a way of life free of Victorian social strictures. Zeitz (American History/Cambridge Univ. ), a contributing editor to American Heritage magazine, has undertaken to chronicle the rise and fall of this icon of modernity through the lives of those who exemplified her and those who promoted her. The author devotes considerable space to the life of F. Scott Fitzgerald, who is variously credited with inventing her, discovering her and/or exploiting her, as well as to that of his wife Zelda. Also sketched in considerable detail are the lives of the women who portrayed her on the silver screen—Colleen Moore, Clara Bow and Louise Brooks—those who wrote about her—New Yorker columnist Lois Long, among them—and those who drew her—fashion artist Gordon Conway and cartoonist John Held. Also profiled are the fashion designer Coco Chanel, whose designs defined her slender silhouette, and Bruce Barton and Edward Bernays, who used her image to promote the sale of consumer goods. The result is a work that feels unduly padded, stuffed full of extraneous facts. These certainly provide color, but it is not clear what Hemingway’s jealousy of Fitzgerald, the fact that Louise Brooks claimed to have slept with Greta Garbo or that Lois Long typed her columns stripped to her slip have to do with the subject. Zeitz does create a picture of a United States undergoing a sexual revolution and experiencing urbanization, an expanding consumer culture and a booming economy, but he burdens it with an excess of irrelevant particulars.